Based in sunny SoCal, they are a team of experts who pour their passion for inspiring kids into playful products packed with serious educational value. For the past 50 years, they’ve made it their mission to bring you kid-powered play through innovative toys, games, and educational tools. From brain-teasing, dice rolling games to ultra-imaginative, kid-powered dinosaur construction vehicle mashups, they've got a little something for everyone. Come on in! Let's play! Introducing Educational Insights, Hot Dots Jr. Let's Master Sets Math and Reading from Pre-K - 3rd Grade. These sets include 100 Lessons to prepare students for learning in certain areas. All sets include "Ace"-the Talking, Teaching Dog interactive, electronic Hot Dots pen or Hot Dots interactive, electronic pen. Pre-K Reading - 100 Lessons to prepare preschoolers for learning in these areas: Letter Recognition, Reading Readiness, Phonics, Sight Words, Punctuation & Grammar. Pre-K Math - 100 Lessons to prepare preschoolers for learning in these areas: Counting & Numbers, Patterns, Time, Shapes/Geometry, Fractions, Measurement, and Math Facts. Kindergarten Reading - 100 Lessons to prepare kindergarteners for learning in these areas: Letter Recognition, Reading Readiness, Phonics, Sight Words, Punctuation & Grammar. Kindergarten Math - 100 Lessons to prepare kindergarteners for learning in these areas: Counting & Numbers, Patterns, Time, Shapes/Geometry, Fractions, Measurement, Money, and Math Facts. 1st Grade Reading - 100 Lessons to prepare first graders for learning in these areas: Phonics, Sight Words, Punctuation & Grammar, and Reading Comprehension. 1st Grade Math - 100 Lessons to prepare first graders for learning in these areas: Counting & Numbers, Patterns, Time, Shapes/Geometry, Fractions, Measurement, Place Value, and Math Facts. 2nd Grade Reading - 100 Lessons to prepare second graders for learning in these areas: Reading Comprehension, Synonyms & Antonyms, Homophones & Multiple-meaning Words, Context Clues, Spelling, and Punctuation & Grammar. 2nd Grade Math - 100 Lessons to prepare second graders for learning in these areas: Counting & Numbers, Patterns, Time, Shapes/Geometry, Fractions, Measurement, Place Value, Money Algebra, and Math Facts. 3rd Grade Reading - 100 Lessons to prepare third graders for learning in these areas: Reading Comprehension, Synonyms & Antonyms, Homophones & Multiple-meaning Words, Context Clues, Spelling, and Punctuation & Grammar. 3rd Grade Math - 100 Lessons to prepare third graders for learning in these areas: Counting & Numbers, Time, Shapes/Geometry, Fractions, Measurement, Math Facts, Money, Place Value, Algebra, Area/Perimeter, and Math Facts. 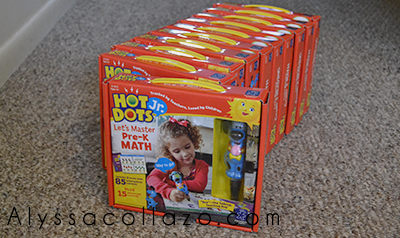 Hot Dots Jr. Let’s Master Sets are a really great way to supplement math and reading lessons in an enjoyable and engaging way. I have a 2nd grader and Preschooler who spent about 30 minutes playing with Hot Dots the first time we tired this product. They loved it. My 2nd Grader struggles a bit in reading, so to see her engaged with Hot Dots reading put a smile on my face. I love how excited she gets about learning new things. I would recommend these products as learning tools. While they love using Hot Dots Jr. Let’s Master Sets they felt like it was extra homework. I insist on using them for at least 10 - 15 minutes a day. 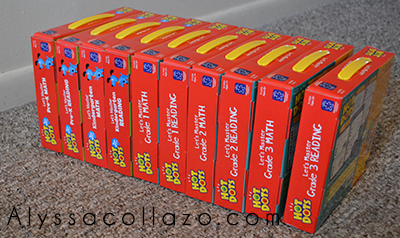 Personally, I would gift Hot Dots as "toys" or "games" to students in grades Pre-K - 3rd Grade. You can find Hot Dots Jr. Let’s Master Sets on their Wesbite or amazon. Sets run from $19.99 - $24.99. Educational Insights also offers a playful promise. If for any reason your Educational Insights' product isn't perfectly perfect, they'll take it back. Whether it's just not what you thought it would be or it stopped working properly, they want to make it right. Simply send it back to them within 365 days of your purchase and they'll happily refund your money. A whole year - no kidding! That should put a smile on your face. My 2nd grader is struggling with math (I blame common core), so he could definitely use that. This is great! I have a Kindergartner that may benefit from something like this! I love it! I will have to share this with everyone I know who has younger kids. This is great! These will be perfect for my little girl for when she gets older. This would be a cool and educational gift for me to buy my nephew for the holiday! Thanks for letting me know about this. I had never seen it before. Those are awesome! I just started homeschooling my toddler and this would be perfect. Oh cool! Those look like great toys! These look great and the price is definitely right! Could be perfect for my preschooler! This looks like so much fun. I bet my daughter would really love it. I like how they package the learning into fun games the kids will enjoy playing. I need this! Teaching my daughter to read has been a crazy experience! This looks great! I need this for my preschooler. She is so ready to read. My son would love these and they would be perfect for a rainy Saturday at home. I'm always looking for new ways to supplement my kiddo's learning at home!